I was shamefully late to the Mumford & Sons train. Though their brilliant first album Sigh No More came out in 2009, it didn't enter constant rotation in my iTunes until early 2011. I know... how embarrassing! I'm not quite sure how I lived my life before songs like "The Cave" or "Little Lion Man" were in it. Thankfully, I have seen the error of my ways and have every intention of purchasing Babel, their sophomore release, pretty much the nanosecond after it is released next month. And though the track list for the album is posted on the band's website, I have been seriously itching for some fresh new Mumford tunes. If you are anything like me, then today is your day, because the band has officially released its first single. 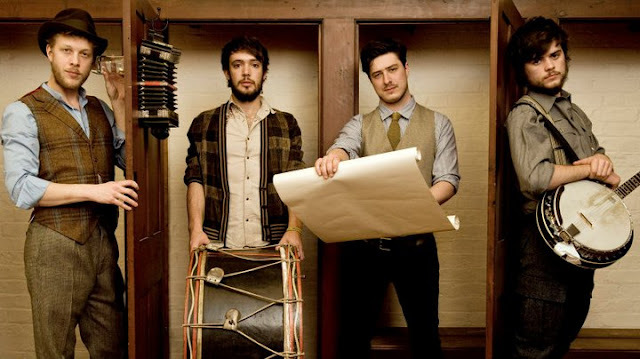 Marcus Mumford has said in interviews that the group had no plans to drastically change their sound or identity for Babel, and "I Will Wait" pretty much confirms that in the most wonderful way possible. The band's signature banjo sound mixed with rich vocals and horns is in full effect. You can feel every emotion in Marcus' voice and the build toward the climax at the end is as good as any found in Sigh No More. What do you think of "I Will Wait"? Does it live up to the Mumford standard? Will you be playing it on repeat until Babel's release next month, or are you worried about a sophomore slump?